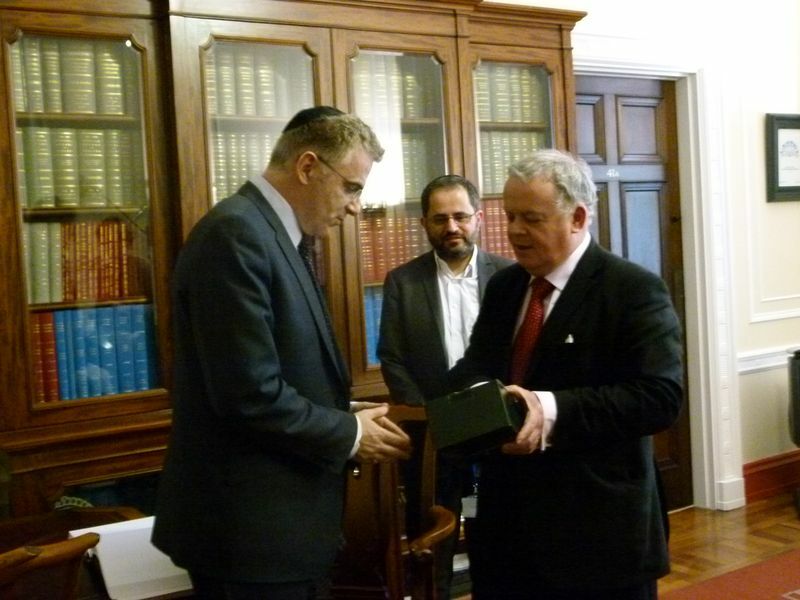 Connections between Northern Ireland and Israel were strengthened this week with the visit by His Excellency, Daniel Taub, ambassador of Israel to the Court of St James. 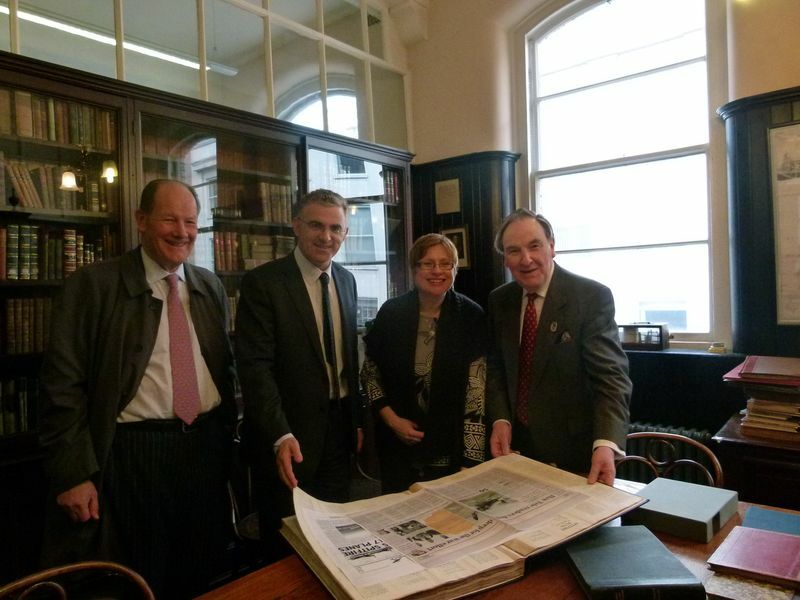 The ambassador met with political and church leaders, grassroots community activists from across the political spectrum and religious divide, spoke on two university campuses, was a VIP visitor both at the Linenhall Library and Titanic museum, was interviewed by the radio and press, and received a standing ovation from over 300 supporters of Northern Ireland Friends of Israel. 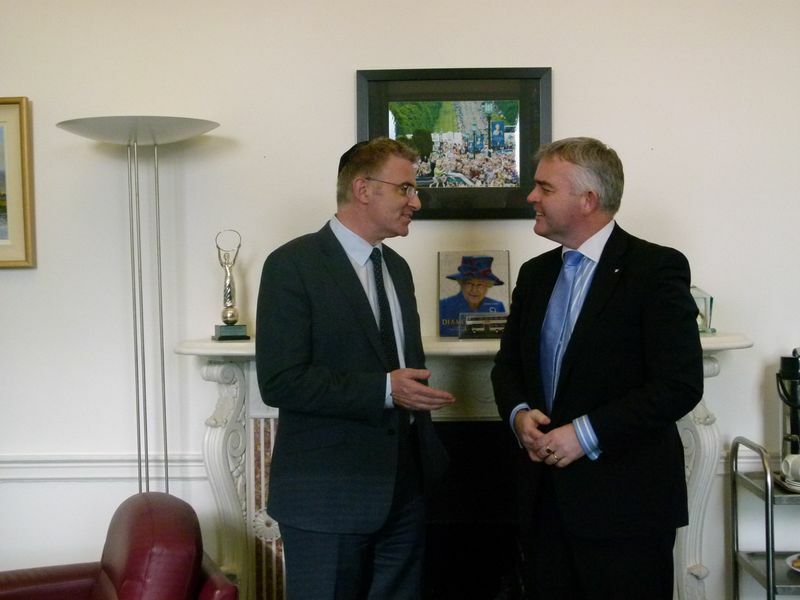 At Stormont, the ambassador was welcomed by the deputy speaker, John Dallat MLA (SDLP), met with ministers at the Office of First Minister and Deputy First Minister, Jonathan Bell MLA (DUP) and Jennifer McCann MLA (Sinn Fein), and Mike Nesbitt (Ulster Unionist) and David McIlveen (DUP). 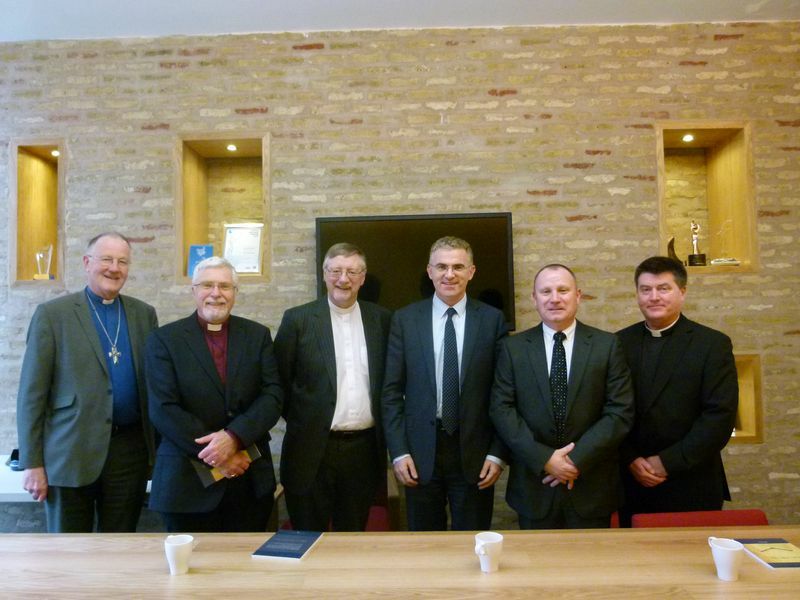 The ambassador met with senior church leaders from the four main denominations and led a wide-ranging discussion on the role of faith in political and peace negotiations. Meeting the ambassador were Rev. Ken Lindsay (head of the Methodist Church in Ireland) , Bishop Harold Miller (Church of Ireland), Rev. Dr. Roy Patton (Moderator, Presbyterian Church), Rev.Gary Mason MBE (superintendant of the East Belfast Mission), and Fr.Colin Grant (Roman Catholic). The ambassador met an array of cross community activists and academics from across Northern Ireland’s political spectrum at a roundtable discussion at the Skainos centre in East Belfast. The topic under discussion was Conflict Resolution Dialogue – learning from the Peace building process in Northern Ireland. Amongst organisations participating were Belfast Conflict Resolution consortium, Causeway Institute, Community Dialogue, PUP, Institute for Conflict Research, Queen’s University, Intercomm, Belfast Unemployed Resource Centre, One Step, the Orange Order and the Victims Commisssion. 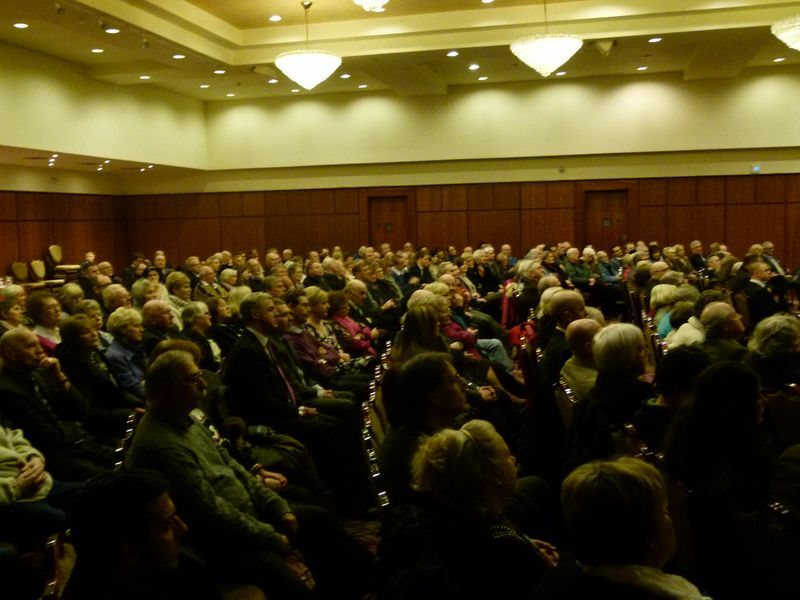 The meeting of the Northern Ireland Friends of Israel drew a crowd of over 300 supporters. NIFI president Gerald Steinberg chaired the event. Amongst those attending were elected representatives from different parties, clergy, and community leaders. Ian Paisley Junior MP started the Q and A session by enquiring into the significance of Israel’s recent general elections. 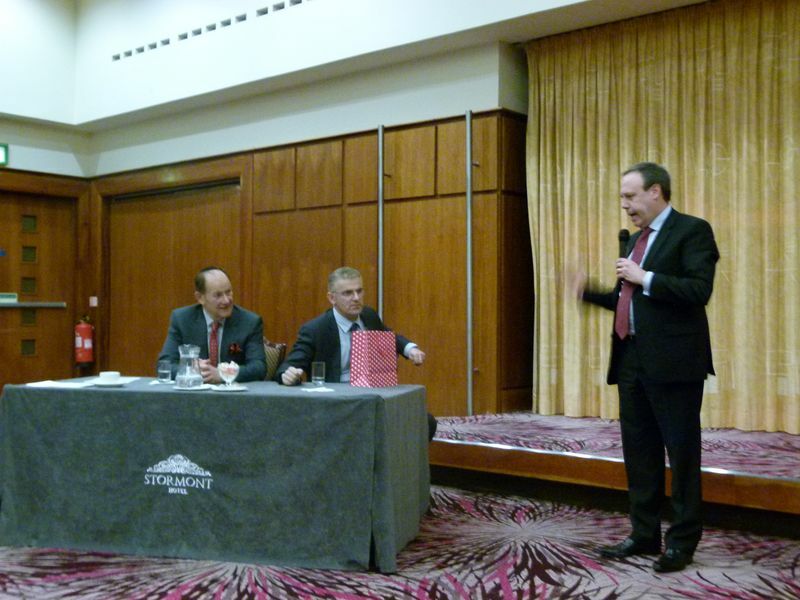 The vote of thanks was given by Nigel Dodds MP. The Ambassador was given a standing ovation.